Event Lighting Basics To Consider! 16 Feb Event Lighting Basics To Consider! Event lighting is more of an art than it is a science. An engineer with years of experience will make the lighting look really easy. It’s not that it’s simple it’s just that professionals understand how lighting works and take the time to understand what customers need. That last bit is really the most important part of good event lighting – understanding the customer’s needs. Each event is different. Some events are outside. Some are inside. Some are going to be filmed. Some aren’t. Some events will feature a presentation or keynote. Some will have live entertainment. Some events will be nothing more than a big party. How do you choose the lighting for such diverse events? Here are a few event lighting basics to think about. Always choose enough lighting to properly light the entire event space. Lighting needs will change drastically between indoor and outdoor venues, the time of day, and what the event will be focusing on. 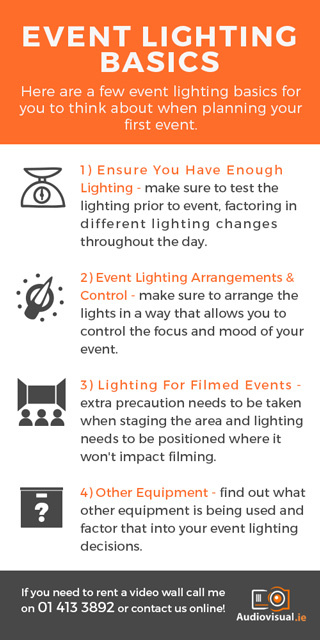 If in doubt, test the lighting multiple times in the venue around the desired times of day the event will take place. The lighting has to be bright enough to allow event attendees to comfortably navigate the area. Unless the event is nothing more than a large birthday party, chances are the lighting isn’t going to stay static. You are going to want to change the brightness of some lamps, but not others, to draw focus and create the proper mood. You need to be able to arrange the lighting in a way the draws focus and set the desired mood for the venue. You also need a way to control to the lighting, most likely with an operator or engineer and liaising with the stage hire provider can get you best results. If the event is going to be filmed, extra precaution needs to be taken when staging the area. Lighting needs to be positioned where it won’t shine towards the camera. Likewise, light needs to fully fill the space that is going to be filmed. There also needs to be enough directional and flood lighting to eliminate any shadows. Keep in mind, cameras can only see a small dynamic range. The lighting needs to ensure that the camera won’t stumble upon a dark area that could force the camera to open or close its iris and darken or wash out the picture. You also need to take into consideration what other equipment is being used at the event. If the event features a lot of projectors, a good diffused, dim lighting might be the best route to go. Likewise, if the event is featuring a band, you might need special effects lighting that won’t blind the audience. The hardest part about putting up the proper lighting is understanding the way light spills into the space. Take time to critically think about what your event needs. Make sure you choose lighting that will fit the needs of the venue, not provide too much or too little light, and make sure the lighting is able to be controlled. I understand that it’s a lot to take in, but take your time or if not sure about what lighting your event needs consult with a professional to ensure best results. As I said before, don’t trade minor budget savings for larger increases in event failure as it’s not worth it in the long run. If you’ve any questions about event lighting feel free to comment below, give me a call on +353 1 4133892 or e-mail me directly ivan@audiovisual.ie.